Sailors Joe Brady (Gene Kelly, Brigadoon) and Clarence Doolittle (Frank Sinatra, On the Town) are out on a four-day shore leave in Los Angeles. Brady is all set to meet his hot date, Lola, but the inexperienced Clarence begs Joe to teach him how to pick up girls. This little diversion somehow winds the boys up at a police station, where a young runaway, Donald Martin (Dean Stockwell, The Dunwich Horror), is refusing to tell the cops his name and address. Donald wants to join the Navy, just like his late father, and Joe and Clarence agree to help. Donald eagerly tells the men where he lives, but when they take there they find his Aunt Susie (Kathryn Grayson) out. When she arrives, Joe assumes the worst, but Susie is actually working as an extra in Hollywood to support her orphaned nephew. Her dream is to become a singer. Clarence immediately takes a shine to Susie. Joe reluctantly agrees to help Clarence get a date with her. 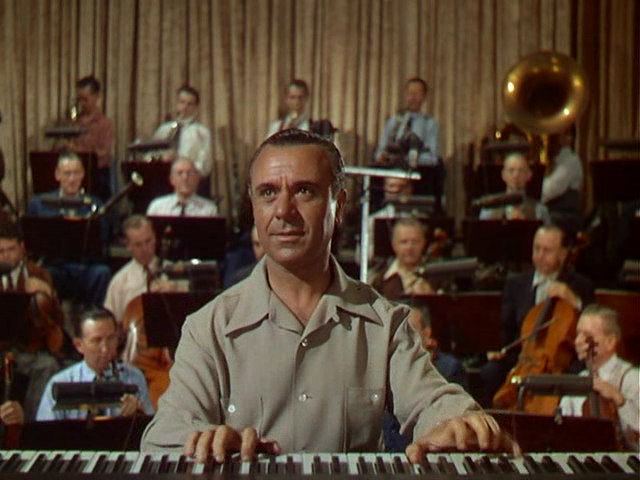 Joe’s lie of getting her an audition with pianist and conductor Jose Iturbi lead to more adventures as Clarence and Joe attempt to get her a real audition, while Joe slowly realizes that he himself is falling in love with Susie…. A lot of genre fare is criticized for consisting of weakly linked set pieces. Horror, action, and martial arts films, these genres include films which, for better or for worse, contain an amazing scene or two surrounded by stock characters in stock situations. In horror it might be a particularly nasty, improbable, or gory murder or perhaps a terrifying sequence that the film drops into the film with little explanation; in a comedy an entire movie can be the set-up for one killer line or on outrageous situation; a martial arts film sometimes consists of one elaborate fight sequence after another. 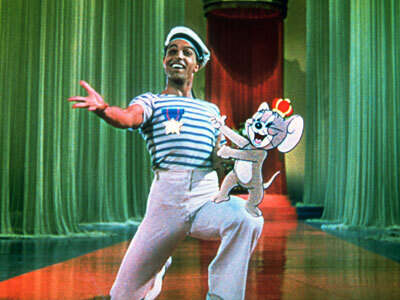 Musicals are no different from these other genres, and while I wouldn’t say Anchors Aweigh is an egregious example, the film does, at times, feel like a series of excuses to get Gene Kelly to dance with Jerry of Tom and Jerry or launch into a Zorro themed Spanish dance on a film set. This is more true in the second half of the film than in the first. There’s a reason Frank Sinatra and Gene Kelly made three films together in just four years, and it’s because they have great chemistry together, more than they have with the actresses playing their love interests. Sinatra plays the goofball or the naïve kid (unexpectedly, at least for a viewer who grew up knowing Sinatra’s later Chairman of the Board persona) who either isn’t interested in girls or has no luck with them, while Kelly plays the ladies man whose really got a heart of gold underneath his wolfish exterior. They make a great team, in comedy, singing, and dancing, each performer complementing and highlighting the other’s strengths. In On the Town the men are paired up with Vera-Ellen (White Christmas) and Betty Garrett, a great dancer and a comic foil for Sinatra respectively, whereas here the men are paired with Grayson, a fine singer whose singing style doesn’t pair well with Sinatra’s. The result is an awkward love triangle which fails to emphasize either man’s talents and which is weakly resolved with the introduction of Pamela Britton (D.O.A.) as a Brooklyn ex-pat waitress to give Clarence a girl. On the Town also features a “C” couple, more comic even Sinatra and Garrett, consisting of vaudeville comedian Jules Munshin and Ann Miller, another fabulous dancer, but here the main subplot is the cuteness of Navy yeggs caring for a precocious tyke. Dean Stockwell is a fine, child actor, but his main purpose is to serve as an excuse to bring the leads together and to set-up Kelly’s dance with Jerry. The story and supporting cast are weak points, but what about the main draw: how are the song and dance numbers? 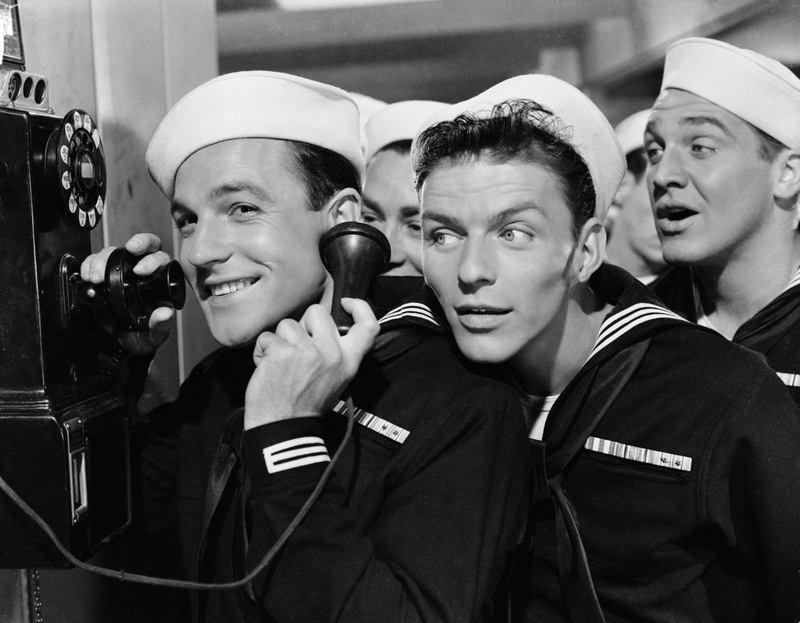 Sinatra and Kelly’s comedic duets, “We Hate to Leave” (sung to their shipmates who are stuck on duty), “I Begged Her” (sung to fellow servicemen about their fictional dates), and “If You Knew Susie” (sung to convince Susie’s date to leave) are all highlights, as are Kelly’s two big fantasy sequences. In both of these scenes Kelly seems completely overjoyed, and while that is probably just the work of a man known to be a perfectionist, one can’t help but wonder if being given the chance to do these scenes isn’t part of the reason that smile on Kelly’s face is so wide. Grayson’s “Jealousy (Jalousie)”, sung in a Mexican restaurant, is a fine example of the 1940s “woman sings a big number in a nightclub” tradition, but the rest of her singing is very much in what I think of as “songbird” style singing, where the point is to show off what notes she can hit. Sinatra solos on the Oscar winning “I Fall in Love Too Easily”, another ballad, and a scene where he sings a lullaby to Donald. All of the dancing is well (and often inventively) choreographed, and the production values are at MGM’s usual high levels. 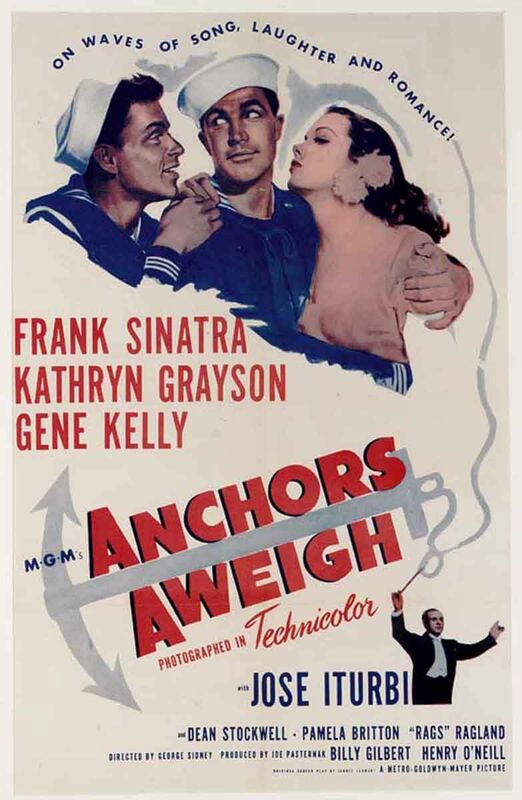 Anchors Aweigh is a solid musical with some stand out moments but is not a must see unless you’re a big fan of Kelly’s. This entry was posted in Buddy Flick, Comedy, Event Film, Full Reviews, Music, Musical, Naval, Reviews, Romance and tagged before they were famous, Best Actor Nominee, Best Cinematography Nominee, Best Music Scoring of a Musical Picture, Best Picture Nominee, Best Song Nominee, composer, Dean Stockwell, Frank Sinatra, Gene Kelly, George Sidney, Joe Pasternak, Jose Iturbi, Kathryn Grayson, Loew's, Los Angeles, love triangle, MGM, pianist, Rags Ragland, sailors, shore leave, World War Two.